Intensive talks are ongoing in Brussels to find a solution to the migration impasse in Maltese territorial waters, according to the European Commission’s chief spokesman. Margaritis Schinas on Monday said that diplomatic efforts had been going on throughout the weekend and had continued today. “We are working the phones. There has been intensive contact with a number of member states which have been ongoing also during the weekend,” he said during a press briefing. Some 49 migrants have been stranded for almost three weeks on board two NGO rescue vessels just a few kilometres off the Maltese coast. Both Malta and Italy have refused permission for the NGOs to enter harbour. So near, so far. The Sea Watch sheltering off Malta. 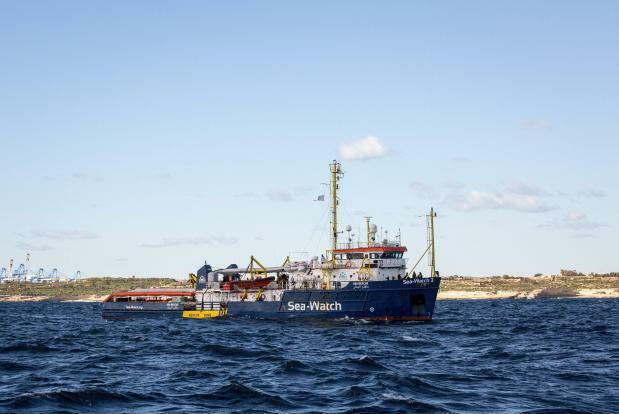 Malta late last month allowed the two ships, Sea Watch 3 and Sea Eye, to enter its territorial waters for shelter from rough seas, while making it clear it could not be held responsible for migrants who were rescued in areas which were not within its competence. Contacted by radio, the crew onboard one of the NGO ships said most of the migrants were depressed, dehydrated, and the situation desperate. On Sunday, Prime Minister Joseph Muscat said letting them in would set a precedent that the government was not comfortable with, while Italy has also kept its harbours closed, amid contradictory statements by its two deputy prime ministers. The commission spokesman meanwhile said “the swift disembarkation” of the migrants in a safe harbour was the key priority at this point. Brussels will be informing the 28 member states of the latest developments later on Monday, and the spokesman said the current situation showed that a serious solution was urgently needed. Fielding questions from reporters, the spokesman said that on a broader note, a possible rethink of some of the Union’s migration policies could be on the table. An asylum policy reform and “other pending issues” would be tackled within the context of the Council of the European Union hopefully before the up0coming European Parliament elections, he said. Meanwhile, the spokesman said the Commission welcomed Pope Francis’ recent call for increased solidarity, saying this was key.